Invent a square wheel (design a lossless LAN). Fiber Channel is option#3 and iSCSI and FCIP are following option#2. Now, keep in mind that both iSCSI and FCIP were designed by server/storage experts, not by internetworking experts. They didn’t want to go into the dirty details of reliable protocol design, so they chose whatever was readily available (TCP) and forgot to consider the performance implications (primarily the required processing power) of TCP overhead. Those of you that are ancient enough to have encountered SNA (among other crazy things I was developing 3274-compatible cluster controllers in those days) might remember the various ways of transporting SNA-over-IP. The standard (DLSw) transported LLC2 over TCP and Cisco also offered FST which did not have the TCP-related overhead. However, there’s a major difference between SNA (LLC2) and SCSI: SNA was designed for lossy environments (it was first used over low-speed modem links) and had acceptable and decently fast error recovery procedures. FST’s only job was to ensure that the packets did not arrive out-of-order (an out-of-order packet caused immediate session reset). You'll find more information on data center architectures, storage protocols and unified fabrics in my Data Center 3.0 for Networking Engineers webinar (buy a recording or yearly subscription). You know my views on Storage networking, but you have explained the poor choices that the storage industry have chosen very well. Always the known and easy to understand which has led into the path of legacy lockup. Similarities with Microsoft Windows are striking. I'm not sure nowadays what all the fuss is about Re: TCP overhead. In the days before TCP offload became common place and checksums were calculated by hand, the overhead *was* material. Every server I've seen recently drives TCP/IP care and feeding directly into silicon. Combine that with jumbo frames (~4 times the size of a FC frame) and 10 GbE uplinks and I just don't see that iSCSI's underlying transport is really an issue anymore. I can concede that in the high end enterprise spaces I think FC still has the advantage but the SMB people get great performance without the FC investment. Along these same lines, I also don't see what all the FCoE fuss is about *except* what it brings to the table re: so-called lossless ethernet. Incidentally, in certain applications (e.g. 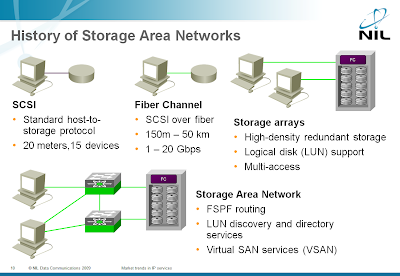 VMware), NFS over TCP is a requirement so I wouldn't point to NFS as a connectionless storage protocol. Perhaps I'm misreading the statement? Incidentally, there are people in the VMware world that wouldn't trade their NFS mounts for a FC LUN. At a certain point, and actually it's quite low, aggregate network (FC included) transport throughput outstrips storage subsystem throughput. The typical SAN is many-to-one; initiators and targets respectively. The ultimate measure of storage subsystem performance isn't throughput in bits/sec at all. It's IOPs. What drives IOPs? Type, quantity and layout of the spindles, RAID levels and settings appropriate for the application. Bad storage subsystem design often has more to do with poor "SAN" performance than the networking protocol. I think the FC/iSCSI airgap does have value in a meatspace context. The storage people have their sandbox and the FC people have theirs. With iSCSI and FCoE that gap is vacuumed out with the networking people telling the storage people how to do things and vice-versa. Lastly, I'm constantly forwarding posts from this blog to peers. Great stuff! how about AOE or ATAoE. This does take the TCP out of the way and decrease the overhead,while being efficient. I'm not sure, why we are not seeing much in this area? How about using SCTP, stream control transmission protocol. I only say this because I was just taking a course where they show how to replace legacy SS7 protocol running over TDM/T1 with SIGTRAN, which is SS7 running over IP, but instead of using UDP or TCP they use SCTP instead. Looks like it could be applicable.